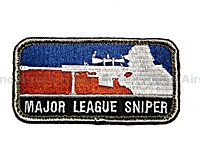 Based on the NBA / MLB style logo, this one is for all the Snipers out there. Although the gun choice was hard, I hope most people can let the Barret slide as a sniper system. Patch is approx 3.5" x 1.75" with black hook velcro sewn on the back.